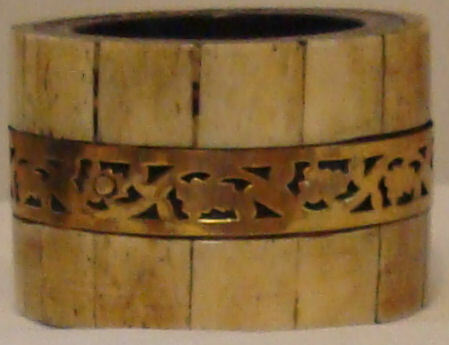 This napkin ring which I found for 50 cents in a gift shop clearance basket will make a beautiful coffee table or display table base. I can see it with a lacquered black top, perhaps with a brass tray, or a glass round. I just can't resist looking at napkin rings; especially those on sale. This set of copper leaves with brass rings was at a great price because one of the leaves had come unglued from its ring. 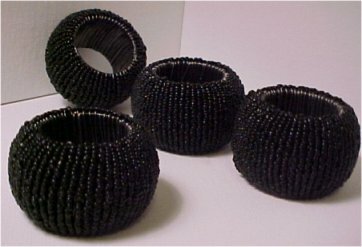 These were drastically reduced from $7.99 to $1.59 for four jet beaded napkin rings. Couldn't seem to get the light right here, but these have vertical rows of closepacked shiny little black beads. With a cushion on top they become seating. I used one as a table, touching up the top with black paint and adding a glass top. You can see it in Bonerella's Millinery. I found these in a rather beat-up plastic bag on a clearance table at Mervyn's; got all four for a dollar. With a bottom added, these could become anything from a fancy large planter to a bathtub. With a glass top, one becomes a table; with a padded top, a seat, etc. 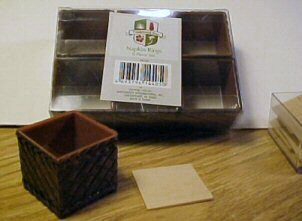 These square napkin rings with their simulated woven sides are ideal as bases for tables; even useful as planters for large trees on a terrace, etc.. I decided to experiment and made one into a hassock for a Safari setting. 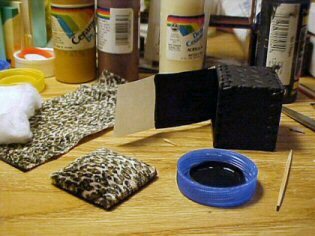 I painted the rather shiny brown with a matte black and discovered that purchased square woodsies fit exactly as tops and bottoms. What you see poking out of the top of the hassock above (lying on its side) is a piece of white label that I have painted black to match. Glued inside, it will form the hinge and lining for the lid. I am still debating as to whether the throw which I plan to put inside should be a matching piece of fur or perhaps a solid color. I made another one with an Americana theme. Here I have coated the back with glue to make it easier to drape and am ready to finish gluing on the fringe. And here it is, ready for my upcoming Americana setting, along with a matching pillow. I also made one like this for a swap. I just couldn't stop myself so decided to try doing one for a children's setting. 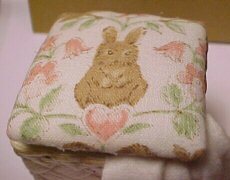 I loved this soft little rabbit print, so it became the cover for my next effort, a children's hamper. The base was given a coat of offwhite, then a light pecan stain was wiped on and off. I could just see a little blankie hanging out of this wee hamper, so began looking through my stash. 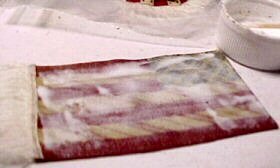 The nice piece of very lightweight white flannel here was a shoe mitt that was in our hotel room at a show we attended. It had a loose stitching across the bottom which just invited something, so I decided to run a silk ribbon through it. 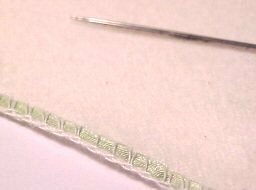 All I did was use a large eye needle and pull the tiny green silk ribbon through the edgestitching. Now didn't that make a nice edging? Here I have coated the back with glue and formed it into soft pleats. The stuffed rabbits were from the same print. I first coated the back of the rabbit on the print with glue and let it dry. Then I cut around it, put a tiny dot of glue on the back and filled in the little shape with cotton, then glued its edges to a floral piece of the same print for the back. Small very sharp scissors help when you're cutting something like this. I touched the edges with brown paint for an old fashioned look. 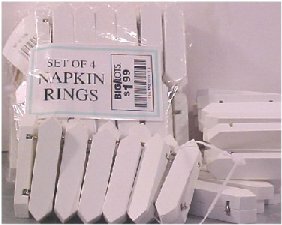 Waverly items are usually expensive, but I got a set of these white picket napkin rings for $1.99. One can never have too many white picket fences, so I bought two sets of four each. They could also make signs or bases of some sort.